These Paleo Egyptian Shish Kabobs are made with a simple marinade that had my mouth watering. Usually lamb is used for shish kabobs, but I use chicken and beef here. You can use chicken, beef, lamb, or a combination of all three, if you like. The meat, spices, garlic, onions, and peppers are a perfect mix. You can add your favorite vegetables to create your own flavor combinations. I used peppers and onions because they tend to have a similar cooking time as the meat. If you choose to use other vegetables that cook at a faster rate, you can put them on individual skewers and cook them separately. Combine seasoning mix with garlic cloves and olive oil in a marinator or gallon-sized plastic bag, add beef and chicken cubes, toss to coat. Cover/seal and allow to marinate for 1-2 hours in the refrigerator. 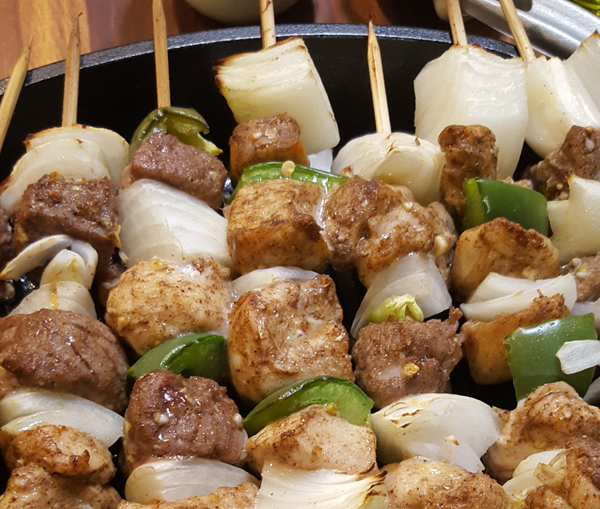 Preheat oven to 400° F. Thread beef, chicken, onions, and peppers onto metal or water-soaked bamboo skewers. Note: If you are using bamboo wood skewers, submerge them in water and allow to soak for 30 minutes prior to use. Next, place the shish kabobs on a cookie sheet or in an oven-safe pan and bake for about 25 minutes (rotating 90° every 5 minutes) until meat is cooked through. I cooked mine across a cast iron griddle. They fit perfectly and the griddle was there to catch any drips, but a cookie sheet will work just fine. Remove the shish kabobs from the oven and allow to rest 3-5 minutes before serving. Enjoy! Prepare your grill: For a gas grill, preheat on high for about 10 minutes. If you are using coals, add enough to cook over high heat for about 10-15 minutes. Place shish kabobs directly on preheated grill, over the flames. Keep the lid open and watch them carefully, so they don’t overcook or burn. Grill 10-12 minutes, rotating 90° every 4-5 minutes, until meat is cooked through. Remove shish kabobs from the oven and allow to rest 3-5 minutes before serving. Enjoy!